I recently got a call from a friend I haven’t seen for a while asking me if I’d like to grab a coffee. He had a few questions about whether WordPress is secure. I’m always looking for an excuse to visit the hip Georgetown neighborhood just south of Seattle, so I jumped at the chance. Plus Chris is an all-round awesome guy who works for a well-known social media startup, so I wanted an update! It turns out they were going to be launching a new website soon and were looking for a robust CMS. WordPress was the obvious choice, but they had grave concerns about security, since the company has a ton of visibility and could become a target for attack. It’s interesting when a good friend asks you a question like this because it makes you reevaluate your opinions and assumptions and make darn sure you’re providing advice that will set up this person that you care about for success. Chris and I had a great chat, and I think it would be most helpful to distill my thinking on whether or not WordPress is secure into a FAQ format regarding the subject. The Premium version of Wordfence does exactly that. Our team works proactively to discover new attacks and to release firewall rules as soon as a new vulnerability is discovered. 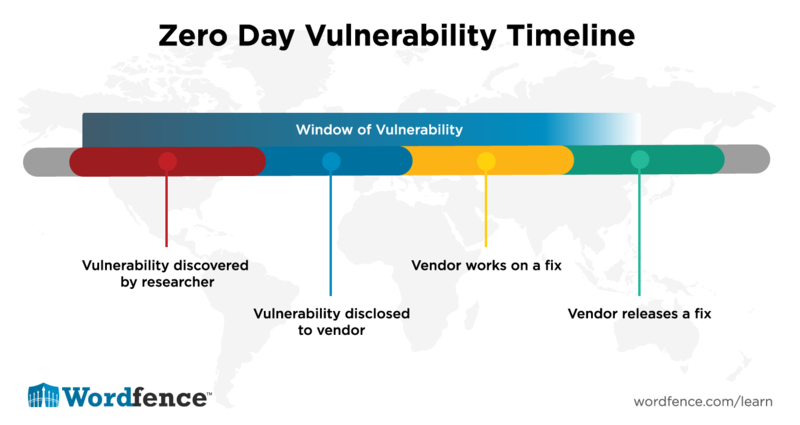 This protects our customers during the window of vulnerability, while the vendor works to release a fixed version of their software. In theory, this website is far more secure than a PHP application like WordPress. The problem is that, other than serving pictures and text, it won’t actually be able to do anything. No comments, forms, content management, e-commerce or any other application functionality. That makes this option unfeasible for most site owners. It’s also worth pointing out that the web server itself is an application, and there have been many vulnerabilities in web servers like Apache and Nginx reported. Eliminating the application does not make a website immune from exploitation. If you run a WordPress site or are just beginning to embark on your WordPress journey, know that you have a massive community behind you, including our team, to help you secure your website for the long term. As always, I encourage you to share your WordPress security perspectives in the blog comments below. 31 Comments on "Is WordPress Secure?" Just curious, if you have a plugin that is "Deactivated" but still in the plugins folder. Does that plugin still pose a potential security risk in the future? It does because the files are accessible from the net. Timthumb is a great exmaple of a deactivated plugin that would still have a vulnerable component - timthumb.php in this case. Excellent point of view on Wordpress security! Thanks Mark. Good article that I will share with as many as possible. I ALWAYS read your posts. As the owner of a small, self-hosted blog it's reassuring to have these security tips outlined so clearly and know I am doing everything I can to keep my website safe. Thanks Wordfence! I used to lie awake at night wondering if my blog is as secure as it could be. I no longer worry about that because I have a pretty good security process worked out, including the awesome WordFence plugin. I've been using WordFence myself and recommending it on my blog for over two years now, and I've felt good about my blog's security ever since. I have VaultPress making daily backups of my blog just in case, but WordFence takes virtually all of the worry out of maintaining a busy blog. "It’s also worth pointing out that the web server itself is an application, and there have been many vulnerabilities in web servers like Apache and Nginx reported. Eliminating the application server does not make a website immune from exploitation." You reference "application" and "application server" in your post and I think that is somewhat confusing. In a traditional LAMP setup, you have the base OS installed on the Server (Linux), You have Apache or Nginx, MySql, and PHP. The web server in this case sits on the Linux server, and I'm assuming when you say application you're referring to the PHP piece, correct? Is PHP essentially the CMS that sits on the web server or in your comment is PHP separate from the CMS as it's own application that is required to run the CMS? That was a typo. I corrected it to say 'application' and not 'application server'. Thanks. This is a great post, and provides good balanced input (IMO) for the small, but attentive, user. If I were running a commercial business.... I don't know. In the past 24 hours, the Wordfence network has blocked from 1.2 million to 1 million attacks. The hacker threat is a daunting threat on any network of blogs, and WordPress has been a regular target, unfortunately. If I knew five years ago what I know now, I am not even sure if I would have invested in any blog. From a business perspective, there becomes an issue with cost/benefit analysis. Is it worth the investment? For a business, if they believe yes, I would consider Cloud CMS, but then you also have to pay for that, which is about $800/month for biz-level. For businesses that can't afford it, then they need to have a serious discussion as to whether they really have the resources to manage a blog. It should not have to be a part-time job for a business staffer, but it could be. Thank goodness for Wordfence for all of us using WordPress blogs for smaller blog efforts and resources, and we have the time to concentrate on it (PT of course). Since there are a "lot" of us on WordPress, there is a good user base. But knowing some commercial businesses the way I do, I would be surprised if they really had the resources to focus on brute force attacks on blog, etc., but then again there are many, many thousands more of us, then there are of such corporate customers. Completely agree with Rick Rouse here. Wordfence makes a tremendous difference to WordPress bloggers. Honestly without Wordfence I am 99 percent certain I would shut down my blog 2 years ago. Today, if Wordfence ever stopped, I would shut down my blog that same day. I own two companies with a major investment in WordPress. One builds and hosts WordPress websites and the other provides maintenance services. I will admit that it has crossed my mind lately to consider a new CMS due to how many security events I deal with for my sites and clients. After reading this, I'm completely secure in my WordPress investment. I now know how to respond when people express concern about WordPress security. Thanks for "putting this down on paper" Mark! Do you know about (and have an opinion about) "easyupdates"? which has recently been bought by updraft. I am running this on all my sites and seems to be keeping the plugin and themes etc up to date with not quite so much effort on my part. Yes, websites can be prevented from running php. However, I'm sure WordFence has cleaned up a number of sites where there was a js hack. I am not sure how server side js enters into this equation or the fact that a while back Mullenweg said js was WordPress's future. Would love some feedback about these questions. I personally go even further. For example Wordpress does NOT run as the same user that owns the files. That means the web server can't write changes to the code itself as it is permission locked. Second I update Wordpress via SVN that way no FTP access or again files owned by same user as running the files is allowed. This again prevents unauthorized code changes. I deploy a custom BASH script to auto update all plugins via cronjobs. This again means less code running and only the owner of the actual files can update them. Finally all files are sync daily into a backup ZFS pool so I can see and rollback ANY changes period. The backup server is not the same server, OS, or even in the same datacenter as the source nodes. Also source nodes are not allowed to contact the backup server as it is one way via firewall rules, user permissions, and SSH keys. Thanks Jeremy. Sounds like a custom setup. This works for some, but many admins don't like to lose the ability to update via the WP UI. These file permissions would remove that ability. WordPress is most definitely NOT secure. Knowing what I know now after having Wordfence installed for about 2 years, I will NEVER recommend WordPress to another client. The short answer is yes, **but it does require a modest amount of work and education on the part of the site owner. **That means the answer to the question, for the average user, is NO. It's secure only AFTER you get hacked (typically within 60 minutes to 48 hours after installation), do hours of cleanup and homework, and install and configure third-party protection plugin(s). There is no way that your regular, everyday users, especially first time users, are even going to think about doing that stuff, let alone actually perform the actions. Experienced or highly technical users will. But the vast majority of people who install aren't. Should they know more and do their research first? Yeah, sure. Will they? Nope. And therefore WordPress is NOT secure. WordFENCE is secure. WordPRESS is NOT. This actually applies to any application, OS or system. Getting secure and staying secure requires some work and some learning. Thank you for sharing your insights, as always. Nicely done and much appreciated! Thank's for all your good advice! I use Xubuntu and everybody say if you use Linux you don't need to care about security problem. And if i try to find some protection but don't find any program interesting for that. Do you think like many other than i don't need to protect my computer if i use Ubuntu updated (xubuntu) ? Good point! --> Security researchers make a living by selling security products or consulting services. They also have egos. Thanks for the info, the post is information rich and helpfully. Good article, and I found your CMS "evolutionary" graph very interesting. The only small quibble is your comments about static sites... "The problem is that, other than serving pictures and text, it won’t actually be able to do anything." In fact, static sites can do a whole lot, when you combine them with third part providers like Formspree and Disqus. And add in static site generators and services like Netlify that handle the whole hosting, DNS, SSL, github, and SSG rendering process, they are becoming a very attractive option compared to the traditional CMS. Not for more complex sites of course, but my first approach is always to consider whether a static site can do the job. Great article. Thorough and objective. Really appreciate this summary. The thing about password protectors, such as 1Password, is that they, too, have been hacked. My own feeling is that I stand a better chance of securing my online activity by using several passwords, than by putting all of my eggs, however unique, into one basket. I'd like to see an article by WordFence about this. No one seems to talk about it. - Last Pass (proprietary software), has most awesome functionality and encryption so even if the cloud is hacked your data is encrypted. LastPass was hacked in the past and it wasn't a big deal for the users, LastPass also handled it well so all in all, the service checked out as robust in face of issues. LastPass also has nice features as checking if a password is secure enough, how long ago it was changed, it can trigger mass password changes on many sites, report if a service you store the password for was hacked so you need to change passwords, etc. - Bitwarden (open source software), a newcomer on the scene with almost equal functionality as LastPass but being open software, it's even more trustworthy. Some small features are missing, some additional, great features are present (that are not on LastPass) so in overall that's the only solution that is equal to LastPass currently. Also data is encrypted before sending to cloud. It's easy to move whole password data from LastPass to Bitwarden. All other password managers are primitive and rudimentary in comparison to those two. Once you start using either of them, you can't go back to using lesser ones. I would add that the hosting policies and practices of the CMS creators also matter as to whether a CMS is secure. This includes the CMS code repository and the plugin/theme repository. If the source code of the CMS itself or the plugins become compromised at source, there is little that the CMS user can do until the compromise is discovered. The Wordfence blog and the company behind it has done a great job of exposing these kinds of problems with plugins being sold to malicious buyers and the buyer injecting malicious code into plugins which get installed onto thousands of websites without the website owners being aware that anything is wrong. Wordpress.org owners, in my opinion, dropped the ball on this by not taking greater care in curating who has access to the plugin repository. Since several plugins I used were taken over and compromised, I lost faith in Wordpress as a secure platform. I don't know if this issue has been resolved at Wordpress.org yet. Although the perspective of code ownership is somewhat different, Drupal.org seems to have a much more robust policy over module ownership and contribution which ensures problems like the above are much less likely to happen. How has Wordpress.org changed to reduce the likelihood of malicious actors taking over ownership of plugin repository code to push it out to Wordpress users? Regarding reliable password managers, I would like to add Roboform to the list. It didn't used to make the grade, but the 8.0 edition finally cuts the mustard.